While the thought of classical music may seem foreign in a part of Brooklyn more commonly associated with gangster rap and hip-hop, the Bedford Stuyvesant Restoration Plaza hosted a special performance by the Brooklyn Philharmonic featuring a remix of Beethoven’s 3rd Symphony “Eroica” by local DJ Eddie Marz. In addition to Beethoven, BKLYN PHIL also played a tribute to the late Lena Horne with vocalist Leslie Uggams, and accompanied artist Yasiin Bey (aka Mos Def) in a unique and energizing performance. Of note, both Lena Horne and Yasiin Bey are natives of Bedford-Stuyvesant, a reflection of the numerous talents to emerge from the neighborhood. 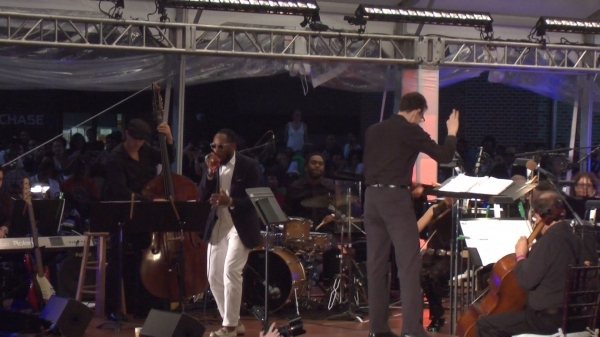 Led by conductor Alan Pierson, the Brooklyn Philharmonic played compositions arranged by Andrew Norman (Beethoven 3rd Symphony and remix by DJ Eddie Marz) and Derek Bermel (“Life in Marvelous Times” collaboration with Yasiin Bey). The orchestra adapted well to the outdoor venue, and fortunately the forecast calling for rain was incorrect and the audience at Restoration Plaza enjoyed a beautiful summer night of music under dry skies. The collaboration between the Brooklyn Philharmonic and Bed-Stuy Restoration was a great way to bring orchestral music to a new audience, and a neighborhood of children who may have few other chances to view a live performance by a symphony. It was encouraging to see how many families showed up for the concert and I personally overheard several children asking their parents about the different instruments being played by the musicians. If for nothing other than to generate interest in music and the arts among the children of Bed-Stuy, then the concert was definitely a success. According to DJ Eddie Marz, the performance incorporated the culture of Brooklyn while introducing kids to a culture that normally doesn’t exist in their world.